‘Did you know…?’ blog series coming soon! We hope you will find this service useful. Posted on April 2, 2018 by EleniP. During the Easter break we will be installing power and USB sockets into three Silent Study Rooms in the Sir Duncan Rice Library which currently have no such sockets. There will, therefore, be no access to the West Silent Study Rooms on floors 3, 4 and 5 between now and Friday April 13. In the meantime, please feel free to use the other Silent Study Rooms still available on floors 1, 3, 4, 5 and 6. The rooms on floors 1 and 6 do not permit the use of any electrical devices within them. Once the work is finished we’ll have 60 additional desks across 3 further silent study rooms to better support access to online materials. Especially useful for the upcoming exams. Apologies for the noise and for any inconvenience caused while this useful work is carried out. Posted on November 17, 2017 by EleniP. Exam time is almost upon us and we are aware that everyone has their own preferred methods to study. We aim to provide somewhere for everyone, whatever their choice, so once again we are changing the use of our Silent Study rooms in the Sir Duncan Rice Library during revision week and for the whole of the exam period. Beginning on November 20 and running until December 15, electronic devices may be used in all of our Silent Study rooms on Floors 1, 3, 4 and 5. This temporary change is due to more people using the library at this time, and this adjustment is the best way to accommodate as many people as possible during this important point in the academic year. However, silence still reigns in room 624 on Floor 6 where there will continue to be strictly silent study with no laptops, tablets or any other electronic devices allowed. Following on from our already fully-booked Library Tours, which will take place on September 4 and 5, we will be running open tours of The Sir Duncan Rice Library over the rest of that week and the following two weeks for all students, new and old. This is to make sure that as many people as possible get the chance to learn about the Library. Starting on Wednesday September 6 and running until Friday September 22, come and meet staff on the ground floor of the library at 10am or 2pm. There is no need to book a place and each tour group will contain a maximum of ten people. 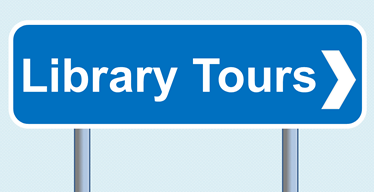 Please note that there will be no tours taking place at the weekends, but staff working then will still be happy to answer any questions you may have about the Library Service. Please speak with staff in the Taylor and Medical Libraries for help in finding your way round their collections and spaces. It’s that time again when The Sir Duncan Rice Library is really busy. We know that everyone has their own favourite way to study, and for many of you this means using a laptop or tablet. During this busy exam period, starting from revision week Monday 25th April electronic devices may be used in all except one of the Strictly Silent areas. If you prefer a “no electronic device” area then head for Room 624 on Floor 6 (south west corner of the building). Some of you may remember our pilot run of using the silent study rooms for extra study space with electronic devices in December last year. It was very successful with a high amount of students using the rooms. We would like to offer this again for the busy exam period. Do you need help finding books in The Sir Duncan Rice Library? The Sir Duncan Rice Library has an enormous collection of books, with over 400,000 items on the shelves. Have you, though, checked Primo, the portal to all our resources, and not been sure where to go next to find the particular book you want on the shelves? Well, read on to learn how to locate the titles you want to read on our miles of shelving. The Shelf Mark (sometimes called the Call Number) is the information you need from Primo to locate titles on the shelves and for any book this will be a number between 0 and 999, followed by 3 letters which are usually the first three letters of the author’s surname. The letters are included so that books on the same subject can then be arranged alphabetically. Take this book for example: Introduction to logic by Irving M. Copi. It has the shelf mark, or call number, of 160 Cop, where 160 is the number for the subject of Logic and Cop is the first three letters of the author’s surname. Quite a simple system really. Floor 6 Reference Items: Ref 300 – Ref 399 Main Collection: 300 – 399 Folios: f300 – f399 The Teaching Resource Collection (TRC) is also on Floor 6 and is shelved in a separate room in the south-east corner of the floor. 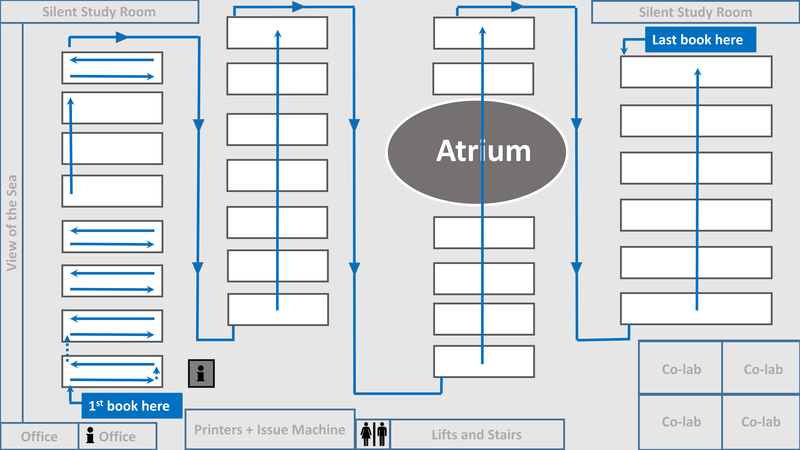 To help you get your bearings on our subject floors keep in mind that the sequence on each floor starts with the first set of shelves (or bays) on the far left as you exit the lifts. This is the side of the library nearest to the sea. This first bay will contain the Reference items for that particular floor, and the main borrowable collection will follow directly after. The bays will continue in sequence, row by row towards the opposite side of the floor. This is repeated for each set of bays as they cross the floor, to the side furthest from the sea. See the image below for the general idea of the direction in which books are shelved in The Sir Duncan Rice Library. Each floor is slightly different but the same principle applies on each of the floors. The shelf marks for each bay are indicated with a notice on the end of each of them i.e 650.01 Cow – 658.049 Tro. All shelf marks between these numbers will be found in that bay. The sequence starts on the top-left-hand shelf and the numbers will read from left to right across each shelf and down onto the next. They then move to the next set of shelves and continue in this way until you reach the end of that bay. Hopefully the information above will make things clearer for you as you look for books in The Sir Duncan Rice Library, and remember that if you are ever having difficulty locating any books on our shelves our staff are here to help you. Happy searching but also don’t forget that being lost in the shelves can often lead to you discovering a wonderful book you didn’t even know you wanted to read: serendipity can be a wonderful thing. As you undertake your PhD it is important that you feel confident that you are locating and managing all the literature and information you require to achieve your research aims. For researchers like yourself the University’s Library Service is here to support you. There are also Induction Sessions available for those new to the University of Aberdeen who wish to learn about how the library service operates here. These sessions will include a talk and a tour, with the opportunity for you to ask any questions you may have about what the library can do to help you with your research. To find out more and to book Workshops or an Induction Session visit www.abdn.ac.uk/coursebooking and look for Information Skills classes. IMPORTANT NOTE: The sessions focusing on the management of references is not suitable for research postgraduates in the School of Law, as the software used does not support the OSCOLA referencing style required for legal theses.